NETWORK FINALS: After adjustment for the NCAA overrun, 60 MINUTES gained 0.4, and NCIS: LA and MADAM SECRETARY were both up 0.1. Elsewhere, GOOD GIRLS rose 0.1 in final numbers. CABLE HIGHLIGHTS: The news was familiar for AMC’s THE WALKING DEAD, with a season finale that was up 0,38 from last week to 1.86, but down an ugly 1.55 from the April 2018 finale, a 45% drop (after the 2018 finale lost 37% from 2017). The rating was also down 1.50 from last December’s midseason finale. 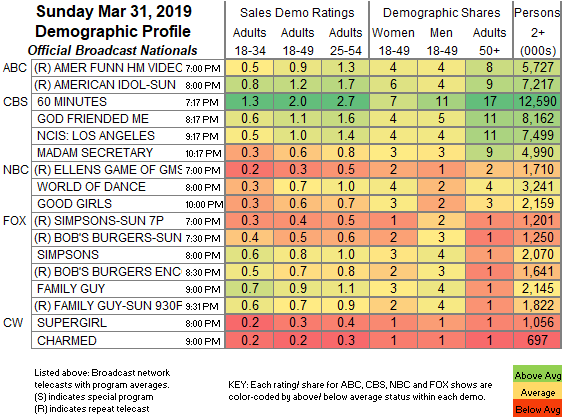 AMC followed the finale with a run of the original series premiere of KILLING EVE, which it was able to call an “original” by including some added footage, at 0.39, and TALKING DEAD (airing at 11:11PM) down 0.04 from last week to 0.29. Adult Swim’s GEMUSETTO MACHU PICCHU was at 0.28/0.20/0.16. On HBO, LAST WEEK TONIGHT returned from a week off at 0.26, the season premiere of VEEP was at 0.18 (down 0.09 from its last premiere in 2017), the season premiere of BARRY was at 0.16 (down 0.06 from last year’s series premiere), and the finale of THE CASE AGAINST ADNAN SYED was down 0.03 to 0.13. On Showtime, BILLIONS was steady at 0.16, the season finale of BLACK MONDAY ticked up to 0.09, the series finale of SMILF lost 0.02 to 0.03/149K, and ACTION was down 0.02 to 0.01/91K. On Starz, AMERICAN GODS held at 0.10, and NOW APOCALYPSE was steady off the chart at 0.02/82K. Bravo’s REAL HOUSEWIVES OF ATLANTA led unscripted, up 0.06 to 0.81, with MARRIED TO MEDICINE up 0.07 to 0.37. The season premiere of E!’s KEEPING UP WITH THE KARDASHIANS was at 0.62, and VERY CAVALLARI jumped 0.09 to 0.27. ESPN’s MLB SUNDAY NIGHT game was at 0.62. On Discovery, ALASKAN BUSH PEOPLE gained 0.04 to 0.45, and NAKED & AFRAID was at 0.43/0.41 compared to last week’s 0.42. Food Network’s BUDDY VS DUFF dipped 0.04 to 0.39. HGTV’s line-up was led by CARIBBEAN LIFE at 0.37/0.32, compared to last week’s 0.30/0.30. 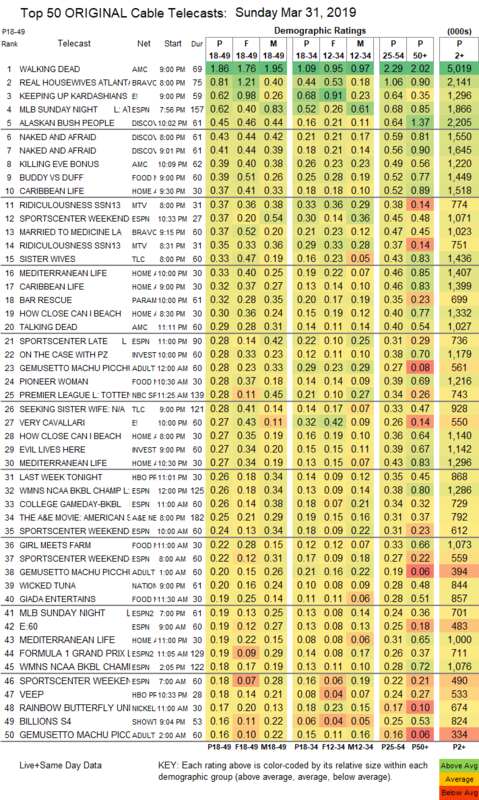 MTV’s RIDICULOUSNESS was at 0.37/0.35, compared to last week’s 0.31/0.29. On TLC, SISTER WIVES edged up 0.02 to 0.33, and SEEKING SISTER WIFE was up 0.02 to 0.28. Paramount’s BAR RESCUE climbed 0.05 to 0.32. On ID, ON THE CASE ticked up to 0.28, and EVIL LIVES HERE was up 0.02 to 0.27.